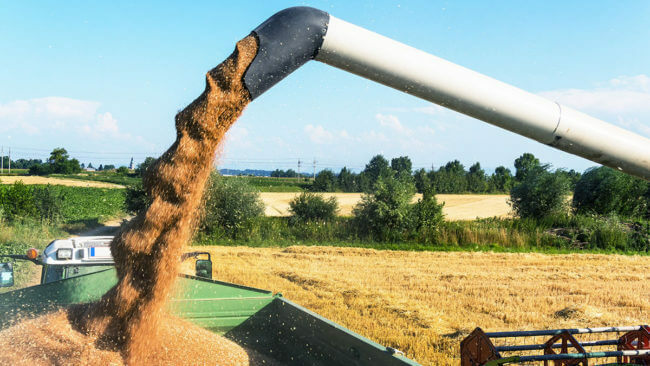 "Despite the higher prices of GE seeds compared to conventional seed, farmers realize economic benefits from growing GE crops through higher crop yields, and/or lower pesticide costs, and management time savings. There is considerable debate over whether GMO crops produce higher yields than their non-GMO counterparts. The short answer: Yes, but not because crops are engineered to yield more but for other reasons. The genetic modifications most used in modern agriculture are designed to make crops that are resistant to herbicides or that produce their own natural insecticide. In that way, GMO crops were not originally designed to increase yields, but rather to protect yields, and that has happened. For example, the increase in yields after the introduction in Bangladesh of insect-resistant (Bt) brinjal (eggplant) has been substantial and well documented in studies. There have been many studies on the topic since the introduction of Monsanto’s herbicide-tolerant Roundup Ready seeds and insect-resistant Bt seeds in the 1990s. There is no doubt that average yields for corn, soybeans and other popular GMO crops have improved since that introduction. Among those studies is a 2018 analysis of more than 6,000 peer-reviewed studies that showed a 25 percent yield increase in corn yields. It’s difficult to determine how much of those increases are due to genetic modification, although much of it certainly is. But increased yields also can be attributed in part to better seed breeding, climate change and new farming technologies. What have researchers attempted to accomplish with the genetic modification of seeds? The first successful commercial GMO crop was the soybean, which was designed to be resistant to Monsanto’s Roundup herbicide, now also sold generically as glyphosate. The combination of seeds and glyphosate made weed management much easier for farmers. They spent less time and money battling the weeds that weaken crop yields. Later came Bt corn designed to produce its own natural insecticide – Bacillus thuringiensis – a protein that is poisonous to some pests. Organic farmers have been spraying their crops with Bt for more than a century. Both of these innovations meant less time and money devoted toward managing pests that damage crops. These GMO traits have since been added to several other major crops, including corn, cotton, canola, alfalfa and sugar beets. And in many cases – corn and soybeans, for example – GMOs now represent 90 percent or more of total crop production in the United States. Have these trait modifications been responsible for increases in yields? Organic food advocates, from Michael Pollan to the Environmental Working Group, often cite media articles or single studies, as well as unpublished reports from groups such as the Union of Concerned Scientists, that suggest there is no yield gain. Some scientists argue that agricultural technology receives more credit than is warranted for average yield increases over the past two decades. Among them is Bret Carver, a professor of wheat genetics at Oklahoma State University. He raised these issues in a 2014 interview with Ag Journal. Carver contends changing climate trends in the last 25 years have benefited corn and bean yields more than GM seed development has. Most of the yield gains breeders have achieved are the result of taking advantage of a longer growing season and the ability to plant earlier in the spring, he said. Despite the claims that GM might be needed to feed the world, we found no yield benefit when the United States was compared to W. Europe, other economically developed countries of the same latitude which do not grow GM crops. We found no benefit from the traits either. The US (and Canadian) yields are falling behind economically and technologically equivalent agroecosystems matched for latitude, season and crop type; pesticide (both herbicide and insecticide) use is higher in the United States than in comparator W. European countries. The report has been criticized by GMO supporters, who say it failed to take into account a range of factors that affect yields, including climate, soils, government subsidies and farming systems. 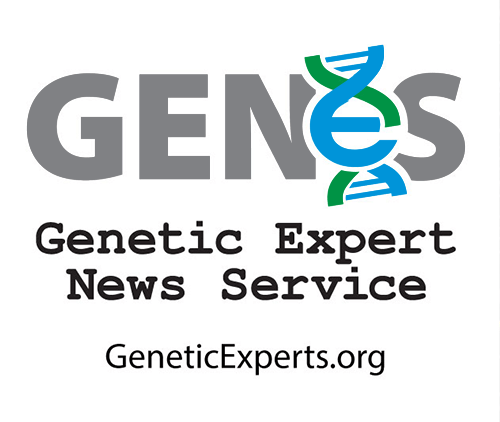 There seems to be substantial synergy among transgenes in reducing risk exposure. This finding indicates that in certain cases transgenic technology can help farmers reduce their risk exposure. In particular, transgenic technology provides new options for mitigating the effects of increased weather uncertainty (for example, owing to climate change). Peer reviewed studies and government-collected research overwhelmingly suggest that yield increases are real and in some cases dramatic. Data from the U.S. Department of Agriculture shows a substantial improvement in corn yields following the introduction of GMOs in the 1990s. Over the following 20 years, average corn yields increased by more than 25 bushels per acre. But corn yields had been rising steadily since the Green Revolution changed the face of modern farming after World War II as farmers increasingly embraced more effective and increasingly less harsh pesticides and synthetic fertilizers. Arguably, the rate of increase might have begun tailing off by the 1990s and GMOs helped prolong the trend. 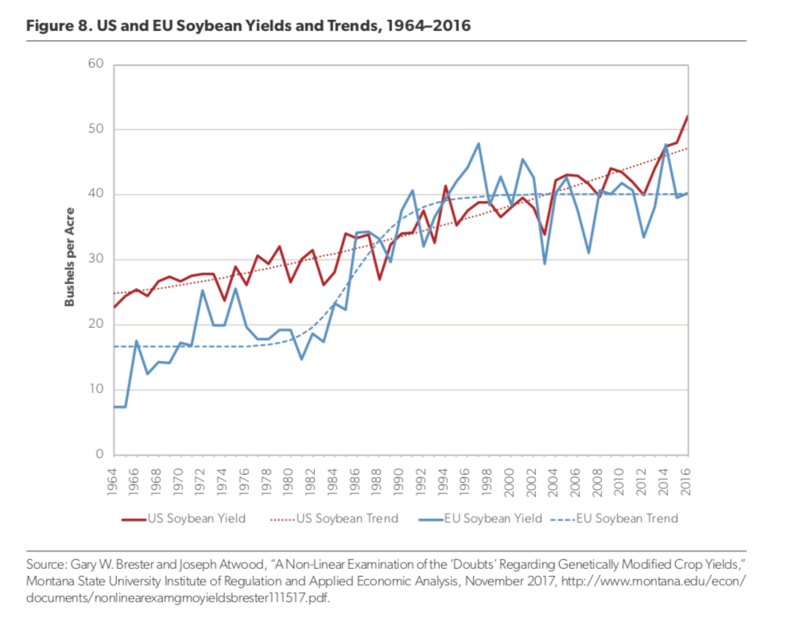 That’s what was argued in a 2017 analysis by Montana State agricultural economists Gary Brester and Joseph Atwood, whose data showed that between 1996 and 2016, EU corn yields flattened while yields in the US continued to climb. The evidence on the impact of HT [herbicide tolerant] seeds on soybean, corn, and cotton yields is mixed. Several researchers found no significant difference between the yields of adopters and non adopters of HT; some found that HT adopters had higher yields, while others found that adopters had lower yields. For instance, an ERS study found that a 10-percent increase in the adoption of HT cotton led to a 1.7-percent increase in cotton yields. HT soybean adoption was associated with a statistically significant, but small, increase in yields: a 10-percent increase in the probability of adopting HT soybeans was associated with a 0.3-percent increase in yields. However, the report did find higher yields from seeds with so-called stacked traits – cases in which seeds have been given multiple traits, such as both herbicide tolerance and insect resistance. As a result, stacked-trait seeds have become increasingly popular, with farmers seeking crops with tolerance to several different herbicides and with resistance to one or more insects. A large majority of U.S. farmers have adopted GE seeds for corn, soybeans, and cotton since their commercial introduction over 15 years ago. Despite the higher prices of GE seeds compared to conventional seed, farmers realize economic benefits from growing GE crops through higher crop yields, and/or lower pesticide costs, and management time savings. A 2014 meta-analysis by two German scientists of all GMO crops found, “On average, GM technology adoption has reduced chemical pesticide use by 37%, increased crop yields by 22%, and increased farmer profits by 68%.” It also found that yield and profit gains were higher in developing countries. In conclusion, our results show how transgenic technology can improve farmers’ ability to deal with a risky environment. The availability of this technology seems important given current concerns about the effects of climate change on production uncertainty in agriculture. 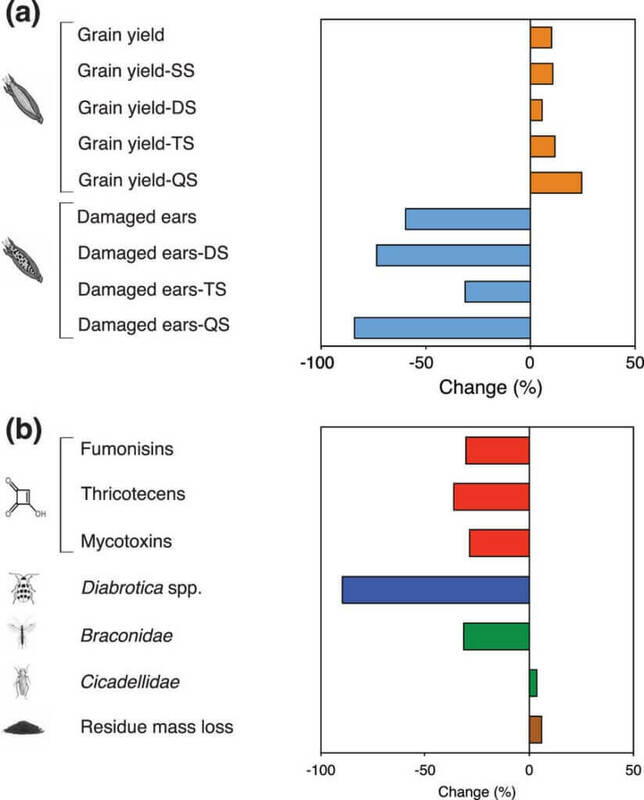 Effects of GMO corn on: grain yield and damaged ears (a), grain quality (toxins), target pest non-target insects, and residue mass loss. Genetic engineering has also resulted a dramatic increase in yields and a sharp reduction in the use of pesticides in the growing of brinjal (eggplant) in Bangladesh, according to a 2018 study in Frontiers of Bioengineering and Biotechnology. That’s led to significant economic benefits for farmers, concluded the scientists involved in developing and releasing the genetically modified crop in a partnership with the Bangladeshi government. Bt brinjal was first released experimentally to just 20 farmers in 2013-14, 108 farmers in 2014-15 and 250 farmers in 2015-16. The new paper shows that Bt brinjal has been effective in protecting crops against the eggplant fruit and shoot borer pest. Experiments showed less than 1 percent infestation, compared with 35-45 percent infestation for non-Bt eggplant, even with weekly spraying. It found a 61 percent saving in pesticide cost, which translated to a 650 percent increase in returns, from $2,151 per 100 acres for Bt brinjal compared with $357 for non-Bt brinjal. The article was widely criticized by scientists for cherry-picking from the NAS report and other datasets. Read in context, the NAS reaffirmed the obvious—no GMO crop has been engineered specifically to increase yields. The two types of genetically engineered corn, for example, were not tweaked to increase yield, but rather to combat losses from weeds and insects. The NAS report did document that the reduction in weeds and insects had a positive yield impact—as many other studies have confirmed. The average yield improvements for developing countries range from 16% for insect-resistant corn to 30% for insect-resistant cotton, with an 85% yield increase observed in a single study on herbicide-tolerant corn. On average, developed-country farmers’ reported yield increases range from no change for herbicide-tolerant cotton to a 7% increase for insect-resistant cotton. There are two competing visions of how it will happen. One is high-tech, with a heavy emphasis on continuing (American biologist Norman) Borlaug’s work of breeding better crops, but with modern genetic techniques. “The next green revolution will supercharge the tools of the old one,” says Robert Fraley, former chief technology officer at Monsanto and a winner of the prestigious World Food Prize in 2013. Scientists, he argues, can now identify and manipulate a huge variety of plant genes, for traits like disease resistance and drought tolerance. That’s going to make farming more productive and resilient.